Let’s start with institutional sponsorship: 187 new positions, 1 sold out position. The last stock I covered with this type of dominance was EDU at $36 in February (it now trades above $90). More than one billion dollars of shares were purchased by the institutional community with much of that going to mutual funds. The money managers haven’t even jumped on board, as of yet! Based on that information alone, I have been accumulating shares and long term calls. As you can see on my trade set-up below, I raised the maximum risk to 2% of total portfolio value to $2,000 for a $100k account. Why? it’s more of a value play for me than my traditional trend trade (but I am grabbing shares like a trend trader). I have included a short term and long term target based on future earnings, chart setups and company potential (basically it’s a pure guess if you really want to know)! The stop is 12% but I could let it run to 15% if my cost basis were to drop from today’s numbers. *Note: I have been accumulating prior to today’s write-up. 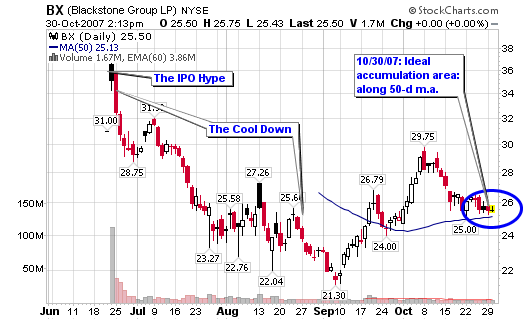 Blackstone (BX) has only been featured on this blog one other time in a post titled Google Blackstone Group (BX) on June 29, 2007. I am not saying that BX will be the next GOOG but it can give you some comfort that GOOG did drop and pause prior to making a run. 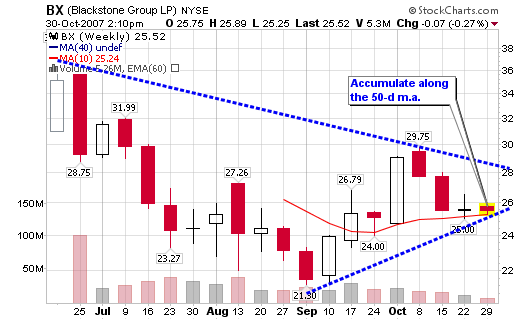 I don’t have a true trend-trading rating on Blackstone but I would lean towards “Buy” over the longer term! The Blackstone Group L.P. is a global alternative asset manager and provider of financial advisory services. It is an independent alternative asset manager with approximately $78.7 billion worth of assets under management as of March 1, 2007. Its alternative asset management businesses include the management of corporate private equity funds, real estate opportunity funds, funds of hedge funds, mezzanine funds, senior debt vehicles, proprietary hedge funds and closed-end mutual funds. It also provides various financial advisory services, including mergers and acquisitions advisory, restructuring and reorganization advisory and fund placement services. The Company’s business is organized into four business segments: Corporate Private Equity, Real Estate, Marketable Alternative Asset Management and Financial Advisory. In October 2007, the merger of Hilton Hotels Corporation with an affiliate of The Blackstone Group L.P.’s real estate and corporate private equity funds was completed. Another very interesting article. I have a couple of questions though, what is the ‘previous’ period that you refer in the ownership data that you have presented. In other words, when you say Shares held previously:6.3 Million, when was this? I don’t have access to current ownership data and I am assuming your figures are the most current. On MSN money, I can see data till 6/30/07 and it seems at that time ownership was about 15%. How does this fit in with your argument that institutional ownership is increasing? I only use one source I trust: Vickers Research. The previous reporting period is the last quarter they reported institutional numbers. I can’t give too many details as the information is paid for and owned by Vickers. You can use MSN but always stay with the same source because these numbers are always different; everywhere you look. Vivkers has been consistent since I have been using them for the past 4-5 years. I don’t think it’s a buy here. The financial are still under water and the sellers are still out there. I’m not touching financial right now – I think that a good buy for bx is the 21 level. But you are right – it’s a good company – and it will be x times bigger in the coming years. I don’t disagree about the $21 area. However, this is just an accumulation on my part. Financial is a tough area to invest right now! 1. You should be aware and make readers aware that the publicly traded BX is actually 20% of the whole Blackstone company.. so the P/E is actually 1.77×5.. and the market cap is roughly 30B..
Chris – I would like to hear your comments on managing the BX entry. According to the original analysis, if someone accumulated shares at the ideal entry of $25.50, the maximum risk is $3.06. That would mean you got stopped out yesterday, however you still like the stock and its prospects. How do you cope with the emotions of still liking the trade, but your system says to cut your losses? My cost is lower than the suggest buy point in the post. I had been accumulating shares prior to the post and I clearly stated that. I am still in and holding with my 12% stop loss. I am maxed out and can no longer accumulate shares because it will raise my risk exposure in this stock. a question about EPS of BX:its EPS estimate is around 1.70, but on MSN money, it is $9.66, and $12(ttm). how to explain it? As Blackstone Group (BX) approaches 52 week lows, and faced with short term lingering uncertainty of overall market health — specifically financial sector viability, BX appears to be a bargain for long term holding. With limited insider trading and institutional investors holding strong, you can count on a few investors taking a little off the table as it starts to recover, however as the market outlook improves, BX will be well positioned.